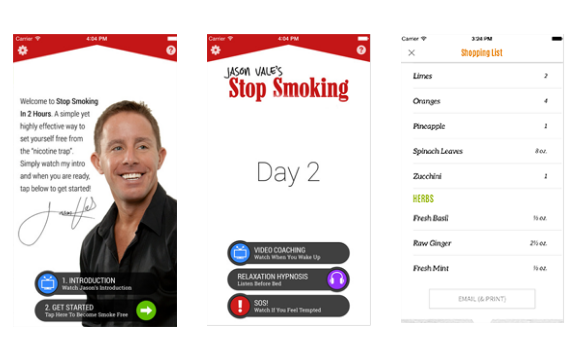 Stop Smoking in Two Hours is a mobile-based app intended to help users quit smoking and remain smoke free. Based primarily on hypnotherapy, the app consists of 3 building blocks. The first part incorporates an audio session lasting 2 hours. This session focuses on the removal of conscious and subconscious desires to smoke. The developer encourages users to listen uninterrupted to the full audio session close to their bedtime, so that they can fall asleep to the hypnotherapy section toward the end. The second part requires users to watch daily motivational coaching videos (3–6 minutes) for the first 5 days, starting from the day after they decide to quit. The developer recommends that users watch these videos in the morning and in sequential order. The third part consists of hypnotherapy audios (20–30 minutes) that the user should listen to every night while going to sleep, at least for the first 7 days. The program contains two additional “SOS” videos (8–9 minutes) that users can watch whenever they have a craving.